The key to the vast majority of personal injury cases is negligence. Negligence means that either by action or inaction, another party is directly responsible for your injury. However, most cases don’t involve clear-cut liability one way or the other. For that reason, the majority of U.S. states make room for comparative negligence. 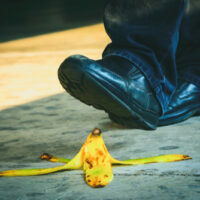 Florida is one state in which comparative negligence is the standard in personal injury suits. For instance, an individual can be held partially responsible for their own injury, and still collect damages from another party. One instance in which this is very common is slip and fall accidents. When considering the question of negligence from the perspective of the liable party (ie: the owner of the property) a plaintiff must establish that the property owner had both a duty to the public to provide a safe place to walk, and breached that duty by either causing the problem themselves, or failing to resolve a problem. In order for a property owner in a slip and fall accident to be negligent under Florida law, they must first be made aware that there is a problem. A property owner cannot be held liable for a foreign substance that caused a slip and fall if they did not first know about the problem beforehand. There is, however, one caveat. There are two bases on which knowledge can be inferred. The first is actual knowledge, which is fairly self-explanatory. The second is constructive knowledge. Constructive knowledge means that the property owner should have known that a slip and fall was likely based on, for example, the fact that a certain area is prone to having stuff spilled there. In other words, the property owner should have inferred based on common sense and precedent, that a certain area was a danger to their customers, and made some reasonable accommodation to see that the area was maintained for safety. If they don’t, it can be argued the incident was a breach of duty. Firstly, the burden of proof is on the plaintiff to prove that the slip and fall was the result of the defendant’s negligence. It may not seem like a vital use of your energy while you’re nursing an injury, but it’s important to your case that you take photographs of the area to show that there was a breach or lapse of care that resulted in your accident. If there is uncleaned spillage or a freshly waxed floor, you want to try to show that it was the primary cause of the slip and fall. If this cannot be established in court, the defendant can try to claim that there was some other unforeseeable factor that resulted in your injury and that they shouldn’t be held liable because they didn’t know about it. Has a Property Owner’s Negligence Resulted in Injury to You? If so, call the office of Alan Goldfarb, P.A. in Miami at 305.371.3111. We’ll make sure you’re compensated for your injuries.